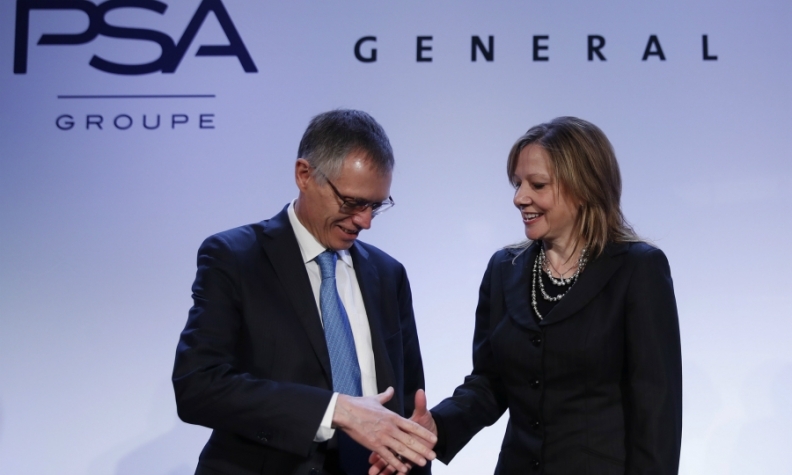 PSA CEO Carlos Tavares shakes hands with GM CEO Mary Barra after completing the biggest auto deal of the year. Tavares aims to do something GM couldn't: make Opel/Vauxhall profitable. The dust has settled on the auto industry's deal of the year, now the hard work starts for the people who will try to make PSA Group's purchase of Opel/Vauxhall from General Motors a success. There will be shock waves at the France- and Germany-based companies and in the overall European automotive sector as PSA-Opel makes big changes. These include slimming down a regional production footprint that has risen to 15 vehicle assembly plants from nine through the deal; reducing a European workforce that has grown to 125,000 employees; shuffling executives to find the correct mix of French and German influence at Europe’s second-largest automaker after Volkswagen Group; and addressing the overlap between the Peugeot, Citroen and Opel/Vauxhall brands. To achieve PSA's goal of returning Opel to profit with an operating margin of 2 percent within three years and 6 percent by 2026, industry experts predict that up to three PSA-Opel plants will close and 5,000 workers will be laid off. In addition, one of the combined group's four volume brands may eventually shut down, some analysts say. These moves are considered overdue adjustments in a saturated European market plagued with chronic production overcapacity. 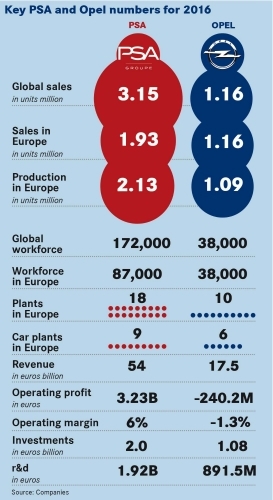 Europe's need for consolidation is one reason why many auto bosses like the deal. "I have always been an advocate of consolidation," Renault-Nissan CEO Carlos Ghosn said at the Geneva auto show last month. Ghosn, who was Tavares' boss at Renault until Tavares switched to PSA three years ago, said size matters, which why his alliance added struggling Mitsubishi Motors last autumn. Scale alone, however, is useless if companies do not share parts and technologies on a massive scale, Ghosn said, although realizing this goal is "something that takes time. Believe me." Ghosn knows this because a frequent criticism of the Renault-Nissan alliance is that after nearly 20 years together the companies still don't share enough parts and plants. Like Ghosn, Fiat Chrysler Automobiles CEO Sergio Marchionne had been a strong supporter of consolidation. In Geneva he said that the PSA-Opel combination "threatens VW most, creating a No. 2 on its heels." VW Group, which has been Europe's largest automaker for decades and rose to No. 1 in global sales last year, rebuffed Marchionne's concerns. "We took Opel and PSA seriously as competitors in the past. These were two brands and now they are under a single roof. I don't believe that a great deal will change," VW CEO Matthias Muller told Reuters. Volvo CEO Hakan Samuelsson said the deal makes sense because volume brands such as Peugeot and Opel, with much of their labor based in high-cost European countries, can boost their profitability either by increasing their economies of scale and volumes or by moving upscale. Opel has tried to move upmarket with mixed results. "The cars are very, very good but they still have to price them according to what the market will accept," he told Automotive News Europe during a roundtable discussion in Geneva. Since the deal increases PSA's European sales by more than 1 million units, it will have greater purchasing power, said Aston Martin CEO Andy Palmer, who used to work for Tavares when both were at Nissan. Another benefit Palmer sees is that PSA will be protected against a hard Brexit or a weak pound, saying that "one of the two is inevitable" in the UK, which represents about 20 percent of overall European sales, but 30 percent of profits in the region. At the same time, Palmer predicts the combined company will find it challenging to establish a specific place in the market for each brand. "This is much more complicated than saying that Peugeot in French and Opel German," he told Automotive News Europe. On the plus side, pricing in Europe is expected to benefit because of the PSA-Opel deal, Toyota Chief Competitive Officer Didier Leroy said. He believes that the price discipline that PSA has shown since Tavares rescued the French automaker from near collapse will be extended to Opel. This could provide some relief in low-margin sales channels such as daily rentals, where the German automaker had been very aggressive, especially in its home market. Meanwhile, executives such as Ford of Europe Chief Operating Officer Steven Armstrong question whether the PSA-Opel deal qualifies as a true consolidation, although Armstrong is sure about one thing. "There will be future consolidation, be it in the form of alliances, cooperations or somebody acquiring somebody else," he said. While Ford's European business is making billions of dollars, GM failed for decades to make a profit with Opel/Vauxhall. One of the big differences between the brands was that Ford was more aggressive at shrinking its European footprint when demand diminished. "We started our restructuring ahead of many of the other brands and are benefiting from it now, proving that you can be a volume player in Europe and be profitable," Armstrong said. "We earned $1.2 billion last year in Europe." Automakers that don't have a solid balance sheet could be in jeopardy because they will need cash to invest in expensive technologies that will make their future vehicles greener, more connected and capable of driving themselves. "The investments that are required are increasing dramatically," said former Nissan Europe sales boss Guillaume Cartier, who started in a global sales role at Mitsubishi this month. "Being big is a way to secure your future." Arndt Ellinghorst, a financial analyst at Evercore ISI in London, called the PSA-Opel deal "clean and financially sound." He added, however, that reaching the Tavares' earnings goals while also achieving 1.7 billion euros in joint cost savings will only happen if Opel/Vauxhall's management team is willing to follow the advice it gets from its new owner and if the European car market remains strong.